iPhoto stores all of the images it imports in a single photo library. It can actually work with multiple photo libraries, although only a single photo library can be open at any one time. But even with this limitation, using multiple iPhoto libraries is a great way to organize your images, especially if you have a very large collection; large collections of images have been known to slow down iPhoto's performance. Creating multiple photo libraries can be a great solution if you have a large number of photos, and need an easier way to manage them. For example, if you run a home-based business, you might want to keep business-related photos in a different photo library than personal photos. Or, if you tend to go a little crazy taking photos of your pets, as we do, you might want to give them their own photo library. Creating a new iPhoto library doesn’t actually affect the current photo library, but it’s always a good idea to have a current backup before manipulating any photo library you're using. After all, there's a pretty good chance that the photos in your library aren't easily replaceable. Follow the instructions in How to Back Up Your iPhoto Library before creating new libraries. To create a new photo library, quit iPhoto if it's currently running. Hold down the option key, and keep holding it while you launch iPhoto. When you see a dialog box asking what photo library you want iPhoto to use, you can release the option key. Click the Create New button, enter a name for your new photo library, and click Save. If you leave all of your photo libraries in the Pictures folder, which is the default location, it's easier to back them up, but you can store some libraries in another location, if you prefer, by selecting it from the Where drop-down menu. After you click Save, iPhoto will open with the new photo library. To create additional photo libraries, quit iPhoto and repeat the process above. If you have more than one photo library, iPhoto will always mark the one you used last as the default. The default photo library is the one that iPhoto will open if you don't choose a different photo library when you launch iPhoto. To select the iPhoto library you want to use, hold down the option key when you launch iPhoto. When you see the dialog box that asks what photo library you want iPhoto to use, click on a library to select it from the list, and then click the Choose button. iPhoto will launch using the selected photo library. Where Are the iPhoto Libraries Located? Once you have multiple photo libraries, it's easy to forget where they're located; that’s why I recommend keeping them in the default location, which is the Pictures folder. However, there are many good reasons for creating a library in a different location, including saving space on your Mac’s startup drive. Over time, you may forget exactly where the libraries are located. Thankfully, iPhoto can tell you where each library is stored. Quit iPhoto, if the app is already open. Hold down the option key, and then launch iPhoto. The dialog box for selecting which library to use will open. When you highlight one of the libraries listed in the dialog box, its location will be displayed at the bottom of the dialog box. Unfortunately, the library pathname can’t be copy/pasted, so you'll need to either write it down or take a screenshot to view later. 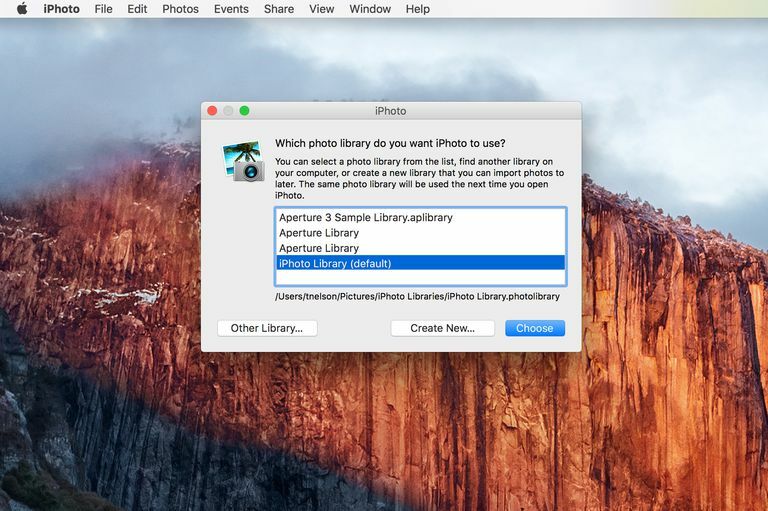 Now that you have multiple photo libraries, you need to populate the new libraries with images. Unless you're starting from scratch, and you're only going to import new photos from your camera into the new libraries, you'll probably want to move some images from the old default library to your new ones. The process is a bit involved, but our step-by-step guide, Create and Populate Additional iPhoto Libraries, will walk you through the process. Once you've done it once, it will be an easy process to perform again for any other photo libraries you want to create.